Three times in the past week I’ve encountered the word “mesmerizing”. One time it was about an actor who gave, I was told, a “mesmerizing performance.” I forget how it came up the other two times, but it was used in that same sense, as a synonym for spellbinding or enthralling. If mesmerizing is about to become the buzz word du jour, I thought it might be worth exploring its origins. The word is derived from a physician/showman named Franz Anton Mesmer (1734-1815). He is sometimes referred to as the Father of Hypnotism, even though he was really the Father of Mesmerism, which is something else. 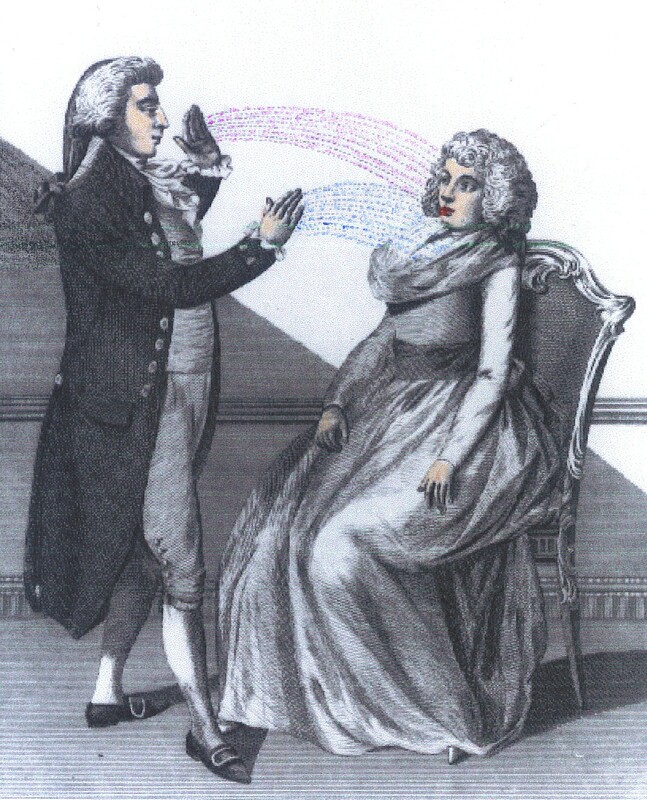 If I understand it — and I’m pretty sure I don’t — Mesmerism has to do with the gravitational or magnetic pull of planets on human beings through an invisible fluid, and the conviction that these influences have a bearing on one’s health. Anton Mesmer also postulated something called “animal magnetism”, stating that one person may have a sort of magnetic force over another person. He certainly must have had some kind of magnetic personality, because he managed to persuade people to hand over substantial amounts of cash for his unusual treatments. Mesmer’s group therapy sessions were a bit like séances. According to Encyclopedia Britannica, “patients sat around a vat of dilute sulfuric acid while holding hands or grasping iron bars protruding from the solution.” These odd practices did not go down well with the medical establishment, and bear in mind that this was at a time when draining a patient of his or her blood was a standard cure. Accused of practicing magic, Mesmer was run out of Vienna in 1778, but he soon set up shop in Paris. Again he flamboyantly promoted his unorthodox cures; again lots of patients were willing to submit to trance-like “treatments” with intense side effects that sometimes included convulsions. Mesmer’s medical procedures were brought to the attention of King Louis XVI; he appointed a commission of eminent scientists and physicians to investigate Mesmer and his claims. Among the commission members were American kite-flying genius Benjamin Franklin, the chemist Antoine Lavoisier, and Dr. Joseph-Ignace Guillotin, who later had a device that removed heads from bodies named after him. By awful coincidence, Lavoisier was guillotined during the French Revolution. At any rate, this commission concluded that Mesmer was a charlatan, although they didn’t say it quite that bluntly; they attributed the “cures” to the patients’ own imaginations. In a way, that validated some of Mesmer’s views about the role the mind played in disease, and it was that mind-over-matter aspect that laid a foundation for hypnosis. It should be noted that Mesmer’s theories about magnetic therapy were “borrowed” in large part from a contemporary of his named — seriously — Maximilian Hell. So if that guy had gotten proper credit, we wouldn’t be saying the actor’s performance was “mesmerizing”, we’d be saying it was “hellish”. Wouldn’t that be cool? This entry was posted in History, Science and tagged Anton Mesmer. Bookmark the permalink. I sure enjoyed your Mesmer post!